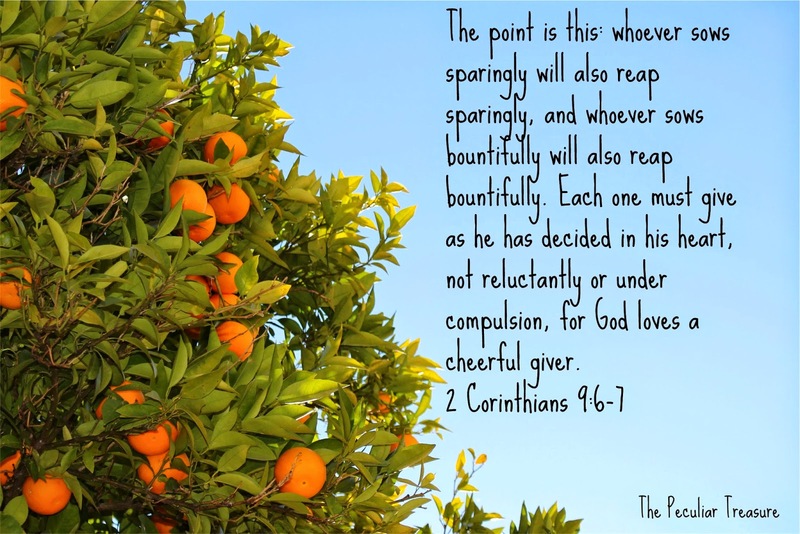 The Peculiar Treasure: Are You a Good Steward? Within the last year or two, I have realized something very disturbing about myself: I am a terrible steward of what God has given me. Terrible. When I survey the untidiness of our home, where we spend our money, how we use our time, yada-yada-yada, I am appalled. Why is it that we can't quite get it together? God has blessed me and Taylor with so much, and we both want to use it for his glory. We want every aspect of our lives to be glorifying to Him. But when we've been out all day, the last thing we want to do is come home and vacuum. If we are exhausted, the last thing we want is to cook dinner so we go out, hurting our waistline and our bank account. 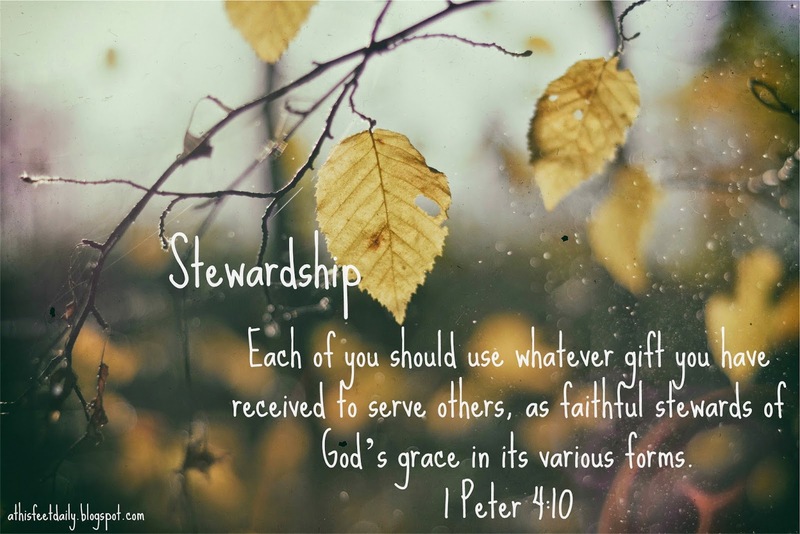 Being a good steward is about taking care of what you have. This means that we must not use our money on frivolous things (like constant fast-food or that soda we didn't need) and instead, tithe consistently and obediently. It means taking care of our home, not leaving it in constant disarray, and making sure that it is in a state of cleanliness and organization. It means taking care of our bodies by putting healthy food in them and exercising. It means making sure our temples are working properly so that we are able to go wherever the Lord calls. The Lord desires that we work hard for Him! This doesn't necessarily mean manual labor. Everyone has a different call. My mom has a mini farm and she is called to work hard at that. One of my best friend's is a graphic designer, and she is called to work at that with all her might; as is my friend who has her own pottery studio. And I have a blog. I am called to work hard at it...not so that I can get more viewers or get people to like me, but so that the Lord may be glorified and so that someone, somewhere, may come to know him through what I write. But our careers are only part of it. Being a good steward means taking care of everything we have for God's glory. Do your pets get neglected? Change that. You committed to taking care of them when you brought them into your life. Get on a strict budget. Do you watch Netflix mindlessly and then forget to read your bible? This is my goal. I want the things in my life that are wrong to change. I want to be so thankful to the Lord for all that he has given me, that I take excellent care of it! I want to give back to him by using what he has given me to it's highest potential. I challenge each one of you to do the same. Join with me in striving towards being a good steward of all God has given us; not to earn his favor or his salvation, but out of a grateful heart for all his blessings. *Note: being a good steward is not about earning God's favor or love. Salvation and the love of Christ is a free gift. We should work hard for the Lord because we love him; not because we believe (the lie) that we must earn his grace. What is the Lord showing you that needs to be better cared for in your life? Monica, I'm so glad you stopped by! I struggle with this so much! I love being comfortable and I love laying around. I grew up in a family of hard workers, so I am not really sure what happened to me, lol. But I really want to do better and have been trying to this week! Thanks, Summer! Hope Spring break has been AWESOME!